Are you interested in hydrocolloids? Are you interested in gelatine in the food industry? The Food Hydrocolloid Conference organized by IMR is taking place in Lisbon from April 28 to 30. Don’t miss the annual gathering of hydrocolloids experts in food applications. As gelatine is one of the two most important hydrocolloids, GME is contributing a speech about gelatine and its important role as a natural protein in the food industry. International speakers will talk about the use of hydrocolloids in food applications, the global market and customer challenges, collaboration and trends such as clean labelling, trust and transparency in the food industry. Visit https://www.hydrocolloid.com/conference.php for further information and to register. GME organised its first panel debate on animal welfare during its biannual General Assembly in March. 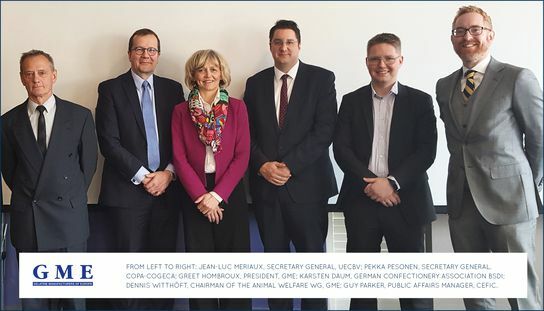 Several experts contributed to a lively and informative discussion moderated by Greet Hombroux, GME President and Guy Parker, Public Affairs Manager at Cefic. As manufacturers sourcing their raw materials from the livestock chain, animal welfare is a relevant topic for gelatine producers, their customers and the consumer. GME anticipated this and sought to hold an exchange of views with other partners in the value chain. Knowledge, experience, best practices and different perspectives on the issues and importance of animal welfare were shared by Pekka Pesonen, Secretary General at COPA-COGECA (European Farmers), Jean-Luc Mériaux, Secretary General at UECBV (The European Livestock and Meat Trades Union), Karsten Daum, Manager at BDSI (Association of German Confectionery Industry) and Dennis Witthöft, Chairman of the GME Animal Welfare Working Group.